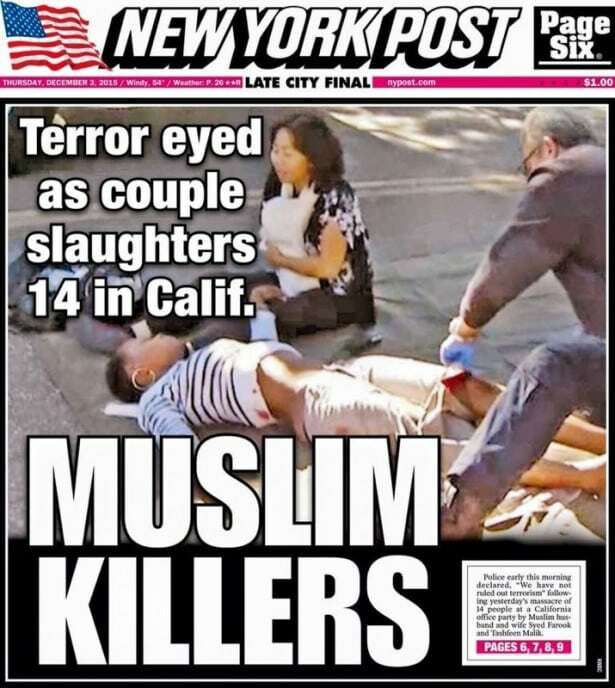 Please do not contact us to ask what the Muslims think about the San Bernardino mass murder. Please don’t ask us whether or not any of our community leaders have publicly condemned the act. You know very well that Muslims consistently condemn acts committed by fellow Muslims even though none other than the perpetrators of the crime can be made to bear responsibility. I understand that Christian theology teaches that the burden of sin can be borne vicariously, in light of what you believe about Jesus Christ. Muslims, however, live according to an Abrahamic principle which you yourselves claim to acknowledge as a universal truth. That principle is that ‘No bearer or burdens shall bear the burden of another.’ So, don’t ask us what we think about this senseless crime. Rather, ask yourself what you feel about this senseless crime. Ask yourself if there was anything that you could have done to prevent it. Ask yourself if you have contributed to the atmosphere of hate which has made so many defenseless Muslim women and children vulnerable now to attacks by jingoistic and paranoid people who believe the only way to overcome their fears is through preemptive acts of violence. For it is you who constantly pose the wrong questions. It is you who offer the wrong answers. It is you who have accepted slave status to big business warmongering puppeteers and their politician puppets. It is you who have chosen to awaken the anxiety of the American public, striking within them the fear of total annihilation and extinction by alien forces invading from Mexico, Central and South America, Africa, Syria and the broader Middle East. It is you who have stoked their fears of minorities (blacks, Latinos, and others) in this country. It is you who have consciously worked to dehumanize “non-white” faces. And, it is you who have made war seem attractive. It is unfortunate that we live in a world where the strong sides with the strong against the weak; a world where the victimizer transforms the image of his victim into his victimizer. The world really does seem to be going to hell soon. What will be left for your own children? What freedom will they have? How safe will they be? And how certain can you be that once the larger forces manipulating us all will, after finishing off its current target, not turn to you next? When will you start asking where are all the Republicans—and Democrats—who condemn the clearly racist and bigoted comments of Donald Trump and Ben Carson? When will you start asking, where are all the white people who disapprove of the public demonization of the Muslims? But, don’t worry. I’m not waiting around for an answer to those questions. I consider them to be largely rhetorical at this point. I understand that you are fine being a mercenary for evil and a slave for profit. But, if you haven’t already realized it, you have chosen to be a member of Satan’s army, knowingly or unwittingly. And we all know what sort of end Satan and his forces will eventually have. Sure. From your vantage point, people of goodwill are losing this battle. But that is simply an illusion. I guarantee you that if you have a conscience, there is hope. I also guarantee you that if you have transcended shame and guilt over your collusion in these crimes, that you are already lost. Remember that the finish line is on the other side.